Dove has recently renewed their large collection of body washes and it promises to give you softer, smoother skin after one shower. 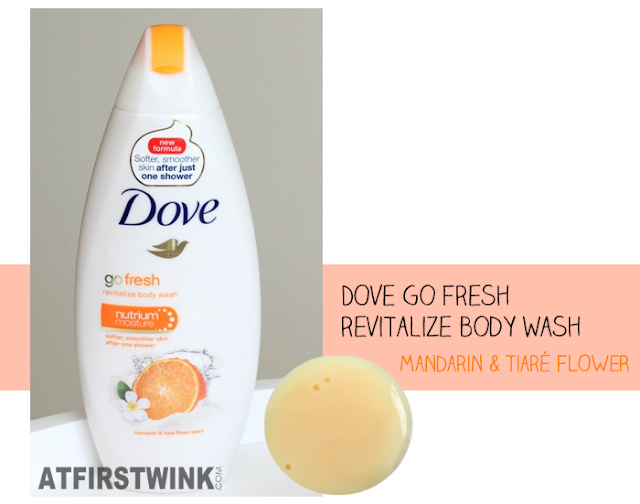 There are three categories (nourishing, go fresh, and purely pampering) and I tried the new Dove revitalize body wash with a mandarin & tiaré flower scent from the go fresh category. I like fresh, sweet, and fruity scents, so the other body washes in the same category (cucumber & green tea, pomegranate & lemon verbena, plum & Japanese cherry blossom, blue fig & orange blossom) sound very nice to me too. This Dove body wash has a flowery mandarin scent with a sweet mandarin scent as the main note and a light flowery scent as an end note. Together, it smells a bit like passion fruit, but once in a while (if you sniff hard enough), you can distinguish the citrus scent of the mandarin. It doesn't have the sharp edges of a citrus scent ("one sniff and you are awake" kind) nor does it have a very strong flowery scent (I cannot really distinguish which part of the scent is from the tiaré flower). The Dove go fresh body wash - mandarin & tiaré flower has a milky orange color that almost looks as delicious as a dessert. You get a thin, creamy layer on your skin, when you spread out the airy foam that you can create with it. I really did get soft skin after one shower, but I have to add that I normally get good results with creamy and milky body washes (including those from Dove). Available in bottles of 250 ml (€3.59) and 500 ml (€5.99).